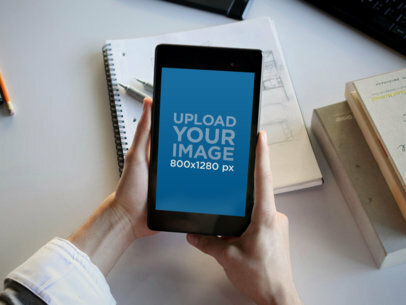 Take a look at this awesome Android Screenshot Generator featuring a Nexus 6 in portrait position while floating, it's a really awesome tool that will let you customize your own image to showcase a great app in a creative and professional way. Start now choosing a background on the right, then change its base color or upload a background of your own with the menu on the right. Upload a screenshot and customize the text with the menu on the left. Awesome, right? Try another Android Screenshot Generator here! A Nexus 5 is being held up in one hand, the other hand gets ready to click on the screen. The background is a cars dashboard and steering wheel. The Nexus 7 is held up in portrait mode and holds a mock up of 1080&#215;1920 pixels. This is the perfect stage for apps you need in your car. Appeal to professionally-inclined millennials with this versatile template. Here, you have the option of showcasing your product on a Nexus Smartphone in portrait or landscape position, whichever works best for you! Let this template, with its softly lit yet still bright background, set the mood of the good things that are to come once your clients start regularly putting your product to use. 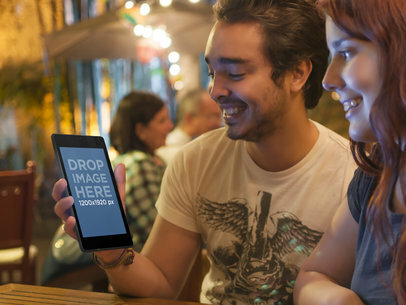 With the man and woman in this image radiating a relatable feeling, your customers will be able to immediately see themselves in place of the actors. To imagine your product into this scene simply, either drag and drop a screenshot of your product or click "Grab Screenshot From URL" above the photo and type the URL as prompted. Placeit will perform the dimensional alterations for you, and the scene will be brought to life with your work as the feature. Foodies will love this one! You can show your app used on a black Nexus 7 mockup in portrait view. The Nexus 7 is being held by a woman at a bistro. She is enjoying a nice glass of red wine and as well as a bread and cheese plate shown out of focus int he background. Everything is set at an antique looking wood table in this great little bistro. 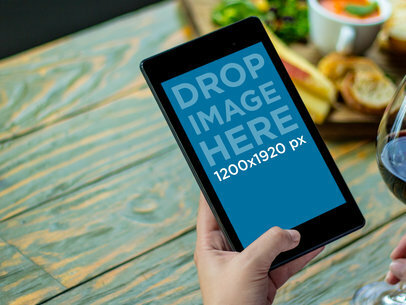 This app is perfect for showcasing food related apps in a 1200x1920px Nexus 7 mockup. This Nexus scene makes for an amazing marketing tool. It features a couple viewing the large Nexus screen. They could be watching a movie together or flipping through a virtual photo album. She could be showing him a number of different things like; a new website she discovered, an item she found while shopping online, a message she received on a new social media app, etc. Whatever this couple is viewing, you can tell they’re enjoying what they see. The close-up of the Nexus screen means you can upload an incredibly detailed screenshot from your own app. Turning this Placeit mockup into an extremely effective promotional tool. This wonderful multi-device mockup shows an iPhone 5s mockup and a Nexus 7 mockup next to each other. The iPhone is in portrait mode while the Nexus is in landscape mode. 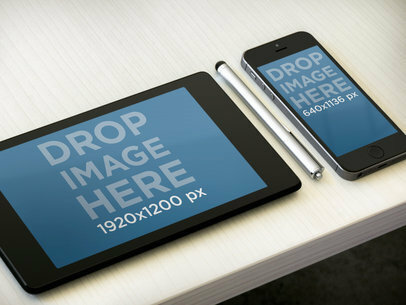 With this device mockup, you can showcase two different versions of the same design. One for iOS and one for Android. A woman holds up her Nexus 7 over a sketchpad with her work at her office as if to take a photo. She is checking your app on the Nexus 7. 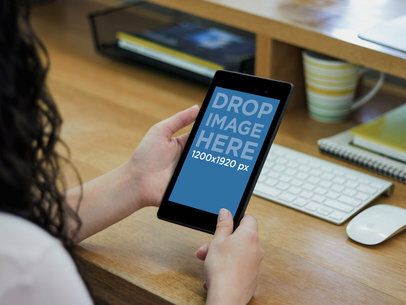 She is holding the Nexus 7 in portrait view and the screen will hold a mockup of 800x1280px. To the left of the work book there are some brown books resting on the white desk stop. This stage is great for a scanning or photo app. 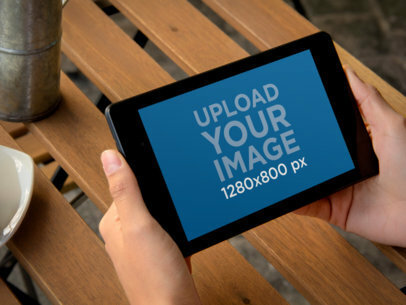 This is a tablet mockup generator that presents a beautiful and relatable scenario. We can see a young woman holding a black Nexus 7 tablet in landscape position while sitting and relaxing in her living room at home. She is also enjoying a hot cup of coffee, which lays over a wooden table. She could be using her Nexus 7 tablet to browse the web, stream a video, read an article or even better, she could be using your new android app! 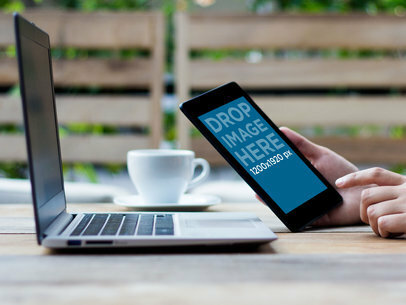 This tablet mockup template provides a great setting for you to display your new app within context, try using this Nexus 7 Mockup Template of Young Woman Drinking Coffee at Home to showcase your android app's features and design in a professional way that will draw the attention of your potential clients and users. Go ahead and use it right away, and remember the small size is always free! 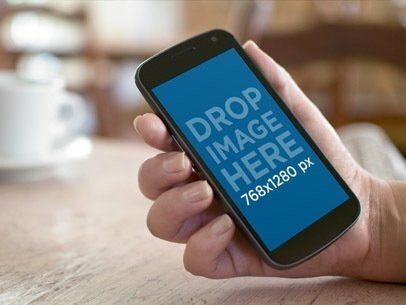 This android mockup features a beautiful Nexus 6 in which you can display that brand new app you just developed. This is a great template because it presents the Black Nexus 6 in a very original and professional way, we can see it is laying over a clear background in an angled portrait position, which can be very flattering for your new app. Android apps tend to have amazing design and features, show off what your app has to offer by displaying it within this Nexus 6 as a part of your app marketing strategy. 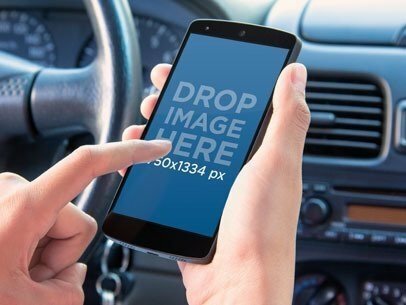 All you need to do is drag a screenshot of your app directly into the screen of the smartphone, Placeit will adjust it to the image and you will receive a photorealistic mockup that will display your android app so that you can share an insight on it to the world, go ahead and try it right away! A casual, outdoors stage with a person using both a Macbook Air and a Nexus 7. The wooden table is complimented by a natural, green background and a white cup. 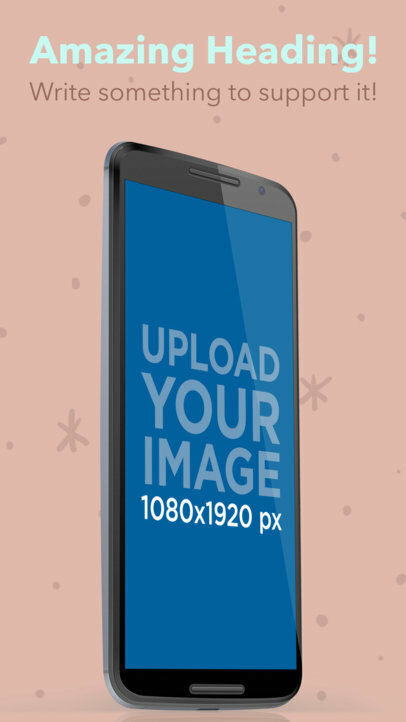 By uploading a 1200&#215;1920 px image or choosing a URL, you can showcase your app or website in a casual setting. You get the perfect at home feel with this stage. You have a white couch on the upper left corner, tilted into view, and a table showing on the right half with a Nexus 7 on it on portrait view. The table is made of dark wood and the Nexus 7 will hold an image of 1200 by 1920 pixels. This scene is cozy and it has white light streaming in. This would look great with any app that you can use to read books or the news. If your mockup has warm tones, it will really stand out in this particular stage. A black Google Nexus 5, held in portrait position. This Nexus 5 mockup has interchangeable backgrounds that range from parks to offices and casual settings. This versatility makes this stage perfect for any Android app mockup. 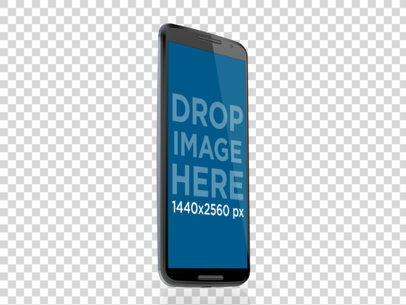 The device is centered in the wide image and allows for 1080 x 1920 px uploads. A woman holds a Nexus 7 in portrait mode. She is at an office. On her desk, you can see her keyboard, mouse, a coffee mug, and notebooks. 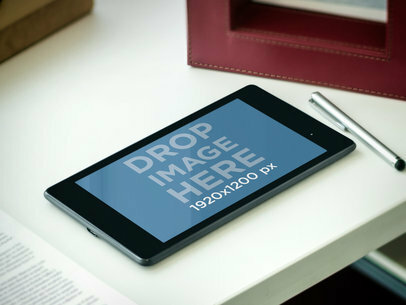 If your app is made to facilitate office work then you need to try this Nexus 7 mockup. 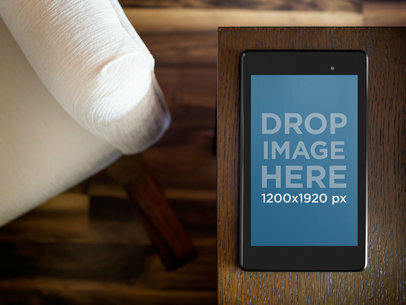 Showcase your mockup on a Nexus 7 set in a cozy work environment. The nexus 7 sits on a light brown wooden desk with its&#8217; stylus nearby. A cup of coffee and a notebook are ready for use nearby. 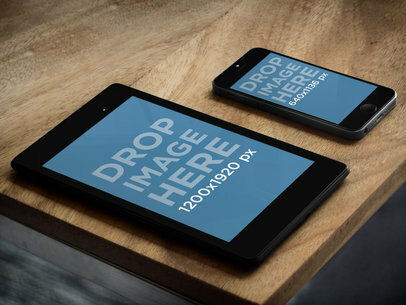 The nexus 7 will allow a mockup of up to 1200x1920px in portrait mode. The desk is brightly lit and the work area will make a great back drop for your mockup. With this stage we have a lovely lady caught right in the middle of enjoying your app. The Nexus 7 mockup is shown in a warm cabin type stage being held by a woman. 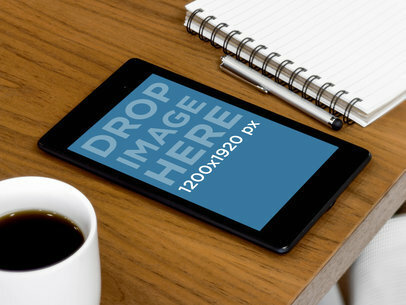 The Nexus 7 mockup can hold an image of 1200&#215;1920. With this being in a cabin type setting it would work great for vacation or leisure apps. The woman can happily use your product to get herself spa treatments or ski trips. This great Nexus 7 mock up is basically just suave business attire to dress your image in. Set in landscape view the Nexus 7 mock up holds a 1920x1200px image. The Nexus sits at a desk in an office setting. The stylus shown next to it as if someone had just put it down. This sleek set would provide the perfect office setting for business related products. With a dab of the human element you can use this Google Nexus mockup for a relaxed look at your app. Great for an everyday app that will simplify your users lives. This Google Nexus is being held by a woman relaxing on a couch enjoying your product. The couch is a cozy grey and the woman is barefoot at home with not a care in the world. Make your product look like it will have anyone relaxing on a coach in no time. The Google Nexus mockup can hold an image of 1280x800px in this landscape view. See more Free Mockups & App Demo Videos here! Here is a Nexus 7 lying flat on a brown, wooden table top at an extreme left angle. To the bottom right of this image are a white and chrome stylus and a cup of black coffee. A few coffee beans lay next to the cup. In the upper portion of this image is a folded newspaper or notebook, grey with white trim. A heavy, stone lamp base sits above the Nexus. The stage on the Nexus will display your product screenshot nicely at a portrait 800 x 1280 px. Place your start-up product screenshot into this Google Nexus 7! The 1280 x 800 px. stage is being held at a right angle at landscape orientation. The business man holding it sits in a chair with his legs crossed. He is dressed in stylish but comfortable grey slacks. A soft reflection of the light above glows off the matte polished wood floor. His right hand is poised above the screen in anticipation of interaction. See more Free Mockups & App Demo Videos here! Two hands rest on a picnic table holding a Nexus 7 in landscape view. On the table a metal container holds pink flowers, to the left of which a cup of coffee sits. 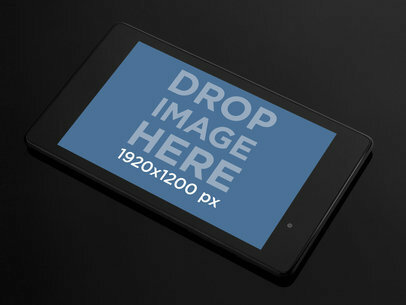 The Nexus 7 will hold a 1280x800px mockup. This is the prefect set up for a reading, video viewing, or casual game app. 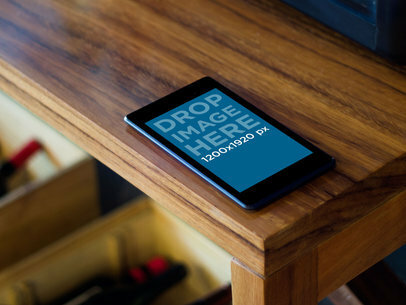 This Google Nexus mockup template shows a female user holding her smartphone at a slight angle on top of a coffee table. Also in the stage, we see a coffee cup and the rest of the coffee shop. 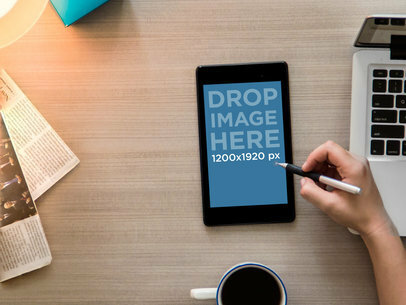 This is a great mockup template for anyone targeting consumers getting things done on the go. It could also work great for anyone reading the news. Got a minute? Take a look at my new score! 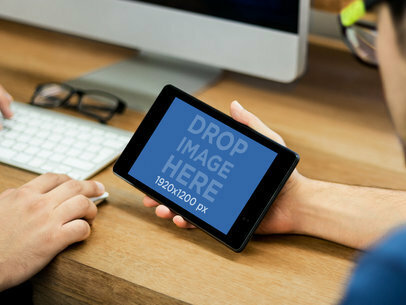 This is a great tablet mockup which presents two coworkers at a creative office, one of them is working while the other one distracts him to show him something amazing on his Nexus 7 tablet mockup template. You can choose to display your new android app or mobile responsive website within this scenario to present it in a clever and professional way that will allow your potential clients and users to get an insight on your app's features and design. Go ahead and use this Nexus 7 at a Workplace Mockup Template to display your android app and enhance your app marketing strategy! All you need to do is drag and drop a screenshot of your app into the Nexus 7's landscape screen, or simply type the URL above, Placeit will take care of the rest. A man works on his Nexus 7 with a stylus. He sits at his work desk. To the left of the Nexus 7 there is a laptop keyboard. To the right a small desk lamp and a couple of sections from the newspaper. 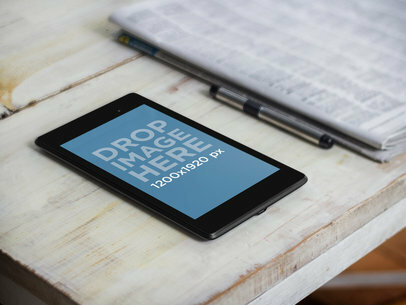 The nexus 7 holds a mockup image of 1200x1920px. This is the perfect set up for a work app that requires a stylus. Your start-up product or new app screenshot will stand out in this black on black image. The black Nexus 7 seems to be floating in space lying on a dark surface. The Nexus lies at a left angle in landscape orientation. The stage is a full 1920 x 1200 px. This mockup is perfect for a focused ad, unhindered by other items in the image. A man plays with a Nexus 7 mockup next to a pile of books. He is probably studying. Help him study with your app! You can upload it to the stage and generate a beautiful product shot in seconds! 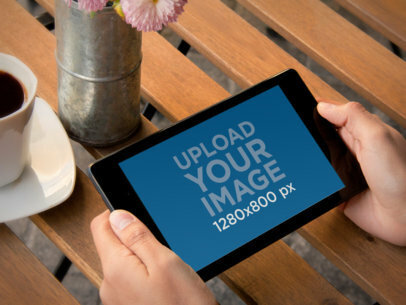 Remember to upload your image in portrait mode, with an aspect ratio of 1220&#215;1920 px. 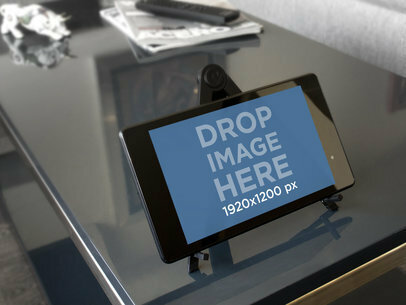 At an edgy angle, a Nexus 7 sits on a two-leg stand on a glass table at a meeting room. At the far end of the table, a newspaper and a small sculpture of a bull. Wall Street maybe? You decide, depending on the app you load on this Nexus 7 mockup. Use it now! 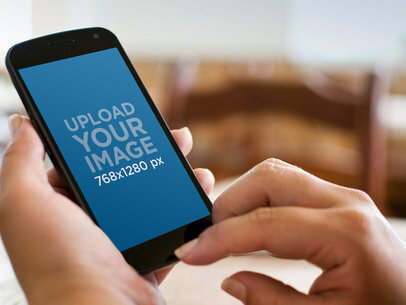 Take a look at this amazing android mockup! We can see a black Nexus 7 being held by a young man in landscape position, the screen sure looks amazing and the best thing is that you can add your own app into this scenario, all you need to do is drag and drop a screenshot of the app and Placeit will adjust it to fit this cool and relaxed environment of a young man using his tablet while eating out at a local cafe or small restaurant. 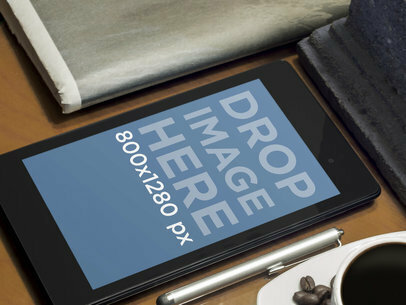 Go ahead and try this nexus 7 mockup template right away, it will do wonders for your app marketing! 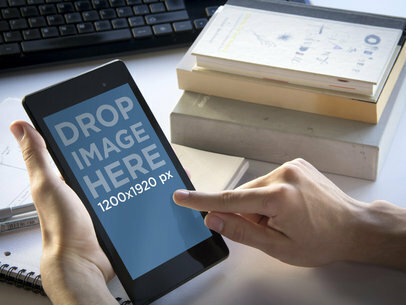 This mockup template showcaes a female latino holding a Google Nexus at home. She’s actively interacting with the iPhone while she’s sitting at the kitchen table. THis is a great Android mockup template for any Android app focusing on any consumer activity from checking emails to todos to any social app to even games! 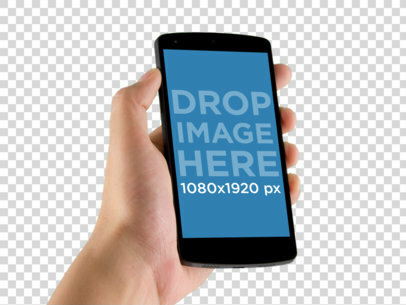 The compsition has a chair blurred in the back while the phone and the user’s hands are to the left of the composition. This Nexus 7 mockup is perfect for a casual reading app or any app that goes well with your morning coffee. 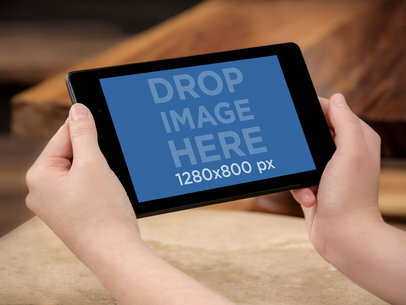 The Nexus 7 holds an image of 1200x1920px. It is laying on a wooden table parallel to this mornings newspaper. The table has a light finish and creates a lovely enviroment. A black Nexus 7 lays on a wooden table next to a cup of coffee and a MacBook Air. You can drop any image on the Nexus 7 to create a beautiful mock-up for your app or website. This stage is perfect for a creative audience or a work-related app. A Nexus 7 lays on a table at a wine shop. At the bottom of the image, you can see the wine bottles in boxes. The overall brown tones are a neutral ambience that would bring out the color in your design. This black Nexus 7 mock-up would be perfect for any app. A woman holds a Nexus 7 in landscape mode inside a coffee house. The neutarl brown background will be able to blend in with any design that you have on your website. So, use this Nexus 7 mockup now.